Earlier this week, the federal government published a bombshell report on carbon pricing, predicting that a nationwide price of $50 per tonne by 2022 will cut emissions by 80 to 90 million tonnes of carbon pollution. That’s equivalent to shutting down up to 23 coal-fired power plants or taking as many as 26 million cars off the road. In other words, a pretty big deal for the climate. The stunning news spread quickly in online circles, shared by renown energy economists, clean energy experts and pollsters. But nobody slowed down to check if the numbers were actually reflective of reality. According to an analysis by Simon Fraser University energy economist Mark Jaccard, the federal carbon pricing policy will only reduce emissions by 10 to 15 million tonnes below 2005 levels — but it will take until 2030 to get there. So the federal government’s claim of a 80 to 90 million tonnes reduction by 2022 is raising some eyebrows. “When I see that, I’m like ‘oh come on guys, you’re trying to pull a fast one on us.’ ” Marc Lee, senior economist at the Canadian Centre of Policy Alternatives, told DeSmog Canada. This might just seem like a boring and wonkish debate over numbers. And in a way, it is. But carbon pricing is currently playing a major role in the current climate policy landscape, viewed as the likes of Prime Minister Justin Trudeau and Alberta Premier Rachel Notley as a key bargaining chip in the campaign to get Kinder Morgan’s Trans Mountain Expansion built. As a result, the amount of emissions that we think the policy can cut matters a great deal — especially if it’s used to justify a new pipeline and subsequent oilsands expansion. Carbon pricing can be a very effective tool for increasing the cost of emitting. B.C. has been a shining example of a carbon tax that is both effective and popular with the public. But disingenuous accounting has undermined faith in both the efficacy of putting a price on carbon emissions and the integrity of climate plans. “The federal climate plan, overall, is weak,” said Laurie Adkin, political science professor at the University of Alberta, in an interview with DeSmog Canada. The research that Ottawa went and produced isn’t really evidenced-based at all. “Pipeline” is my musical response to the Kinder Morgan pipeline. If you like it, please “like” it, share it and sing it! Full credits, lyrics, sheet music and other info about “Pipeline” can be found at http://www.bossin.com/pipeline. Come join a multi-faith choir and a Muslim meditation group on Burnaby Mountain as they add to the spiritual opposition against the Kinder Morgan pipeline. From the trampling of the rights of indigenous communities in BC to spending $2 billion to bailout a Texas oil giant, there are many reasons to stop the Kinder Morgan pipeline. On the home front, Mr. Trudeau asserts that pressing forward serves the “national interest.” He has repeatedly declared the “pipeline will get built” by citing a clause in Canada’s Constitution the government could employ to override provinces for projects of nationwide importance. Yet Canadians largely wouldn’t benefit under this scheme because most oil revenues don’t flow to public coffers, rather, increasingly to foreign companies. Even the supposed Asian demand has been vastly exaggerated. Exporting raw bitumen also would ship away potential refinery jobs. And legal experts argue that so-called national interest doesn’t trump Aboriginal rights that are equally enshrined in the Constitution. Big-footing British Columbia and its First Nations, even if constitutionally viable, would likely damage Mr. Trudeau politically. Is he willing to tarnish his image and Canada’s peaceful reputation by deploying the military? He’s now in a familiar standoff against some of the country’s most tenacious environmentalists, reared in the birthplace of Greenpeace. In the 1990s, the “War in the Woods” protests against the logging of old-growth trees in Clayoquot Sound prompted major changes to provincial forestry policy; it was ultimately named a Unesco Biosphere Reserve. Fifteen years later, pitting the army against Indigenous grandmothers and teenagers simply for protecting their waters and the Earth could jeopardize 18 of his party’s parliamentary seats. Mr. Trudeau all the while is keeping up appearances abroad, like recently vowing to “redouble” climate efforts with President Emmanuel Macron of France. That smacks of duplicity when a day earlier he offered public money to backstop the pipeline. Should the government guarantee investment, the company could attempt construction with minimized risk, and if that fails, head home while casting Canada’s politicians as an inept scapegoat (and potentially setting up a multi-billion-dollar lawsuit against Canada under Nafta). But it’s a long shot for sureties so soon. Whether he likes it or not, Mr. Trudeau is left with but one viable option: discard the pipeline and focus on greener pastures. To create jobs, he should ramp up the environmentally sustainable infrastructure program he campaigned on and pivot to the accelerating renewable energy sector. Mr. Trudeau speaks persuasively about Canada’s leadership on climate, but in reality he’s trying for the impossible: to convince every side that he can please them. A pipeline will either go in the ground, or it won’t. The prime minister must show he’s worthy of his job before the 2019 election and act decisively. Rather than choosing between the provinces, or the oil lobby and eco-conscious voters, he should think hard about what best embodies his “sunny ways” principles — justice, science and saving the planet. "BCI manages pension investments for 569,00 British Columbians including BC Premier John Horgan's pension..."
..what a joke. after ignoring indigenous folk on the incredibly damaging and invasive issues re: site c and lng you have this public relations about how much the ndp care about undrip. this is a move right from the trudeau play book re: the approval of kinder morgan. Never mind, says Justin Trudeau: “This pipeline will get built.” In Vancouver on Monday, Trudeau said Trans Mountain would mean cheaper gas for Vancouver, where it currently costs $1.60 per litre, the highest price in North America, next door to the oil sands. Well then, he needs a bill to approve it, and his government needs to get a move on and fast track legislation through the House and Senate. With the House out for the Victoria break the week after next, there’s only 16 sitting days left before the Kinder Morgan deadline expires. The government can’t do this with a Cabinet order—that would be too susceptible to legal challenge. The prime minister needs something that’s court-proof, and it’s called the Constitution. The government can invoke Section 92 (10) of the Constitution Act, but Parliament must approve it. Section 92 (10 a) of the Constitution establishes federal jurisdiction over interprovincial and international transportation over railways, canals and “other works and undertakings.” TMX fits that description, literally down to the ground. The declaratory power hasn’t been invoked since 1993, declaring Canada’s nuclear energy industry to be within federal jurisdiction. In all, the declaratory power has been invoked on over 400 occasions, only once since 1961, nearly two-thirds of them to approve railway routes. The duty to consult First Nations has been affirmed by the Supreme Court pursuant to Section 35 of the 1982 Constitution Act on aboriginal rights, but it’s not part of the Charter of Rights and Freedoms. Seven B.C. First Nations are challenging the pipeline in the federal court of appeal, and the cities of Vancouver and Burnaby support their case. And now the question has arisen as to whether the consultations before the 2016 green-lighting of TMX by the feds were essentially a just-for-show process show as part of a pre-determined decision. Then where’s the necessary legislation? The Conservatives would support a bill in a heart beat while the NDP, conflicted between their provincial governments in B.C. and Alberta, have called for a reference to the Supreme Court. None of which mitigates the political risk to Trudeau in Alberta and B.C. The Liberals are already in danger of losing their three seats in Alberta, and could lose up to 10 of their 18 B.C. seats if progressive voters in the lower mainland and Vancouver migrate to the NDP over the pipeline. However, an Angus Reid poll last week found support for TMX in B.C. had increased from 48 to 54 per cent over the last month, with majority support in all regions of the province. Kinder Morgan Inc.’s proposed expansion of an oil pipeline to Canada’s Pacific Coast will never happen because local opposition to the project that’s dividing the nation is only going to intensify, according to the mayor of Vancouver. “I don’t think this project will go — I really don’t — based on the resistance on the ground,” Gregor Robertson said in an interview Tuesday at Bloomberg’s headquarters in New York. A Kinder Morgan shareholder vote for an annual environmental sustainability report indicates investor concern about the Trans Mountain pipeline expansion proposal, says an Indigenous leader who addressed the company's annual shareholder meeting in Houston on Wednesday. Chief Judy Wilson was among a group of Canadian Indigenous leaders who reaffirmed their opposition to the Trans Mountain proposal at the meeting where shareholders passed two of three non-binding proposals calling for improved environmental reporting. Wilson represents the Neskonlith Band of the Secwepemc Nation, which holds land title over a stretch of more than 500 kilometres of the proposed 980 kilometre pipeline, and is fighting the pipeline expansion in court. "The passage of the sustainability reporting resolution is a victory and a sign that institutional shareholders are concerned about the opposition to the Trans Mountain expansion project and the perceived lack of understanding that the company has demonstrated of the rights of indigenous people," Wilson told a news conference following the meeting. The proposed new line would mostly carry diluted bitumen and other heavier oils. “No matter what the Canadian government does to address political or financial risk, it will not change our resolve to oppose the project. This will result in more delay, risk and uncertainty,” Wilson told Kinder Morgan investors while moving the resolution calling for the company to issue annual sustainability reports, which passed with a majority of votes. Wilson said another Indigenous leader, Rueben George, of Tsleil-Waututh Nation, had spoken to the company’s annual meeting two and three years ago to warn the company that the pipeline expansion would not be built, and that it seemed Kinder Morgan was finally coming around to this reality. “…We are sorry that all this time and money has been spent. It could have been avoided, and having a sustainability report might have allowed your board of directors to more accurately evaluate these project risks,” she said. 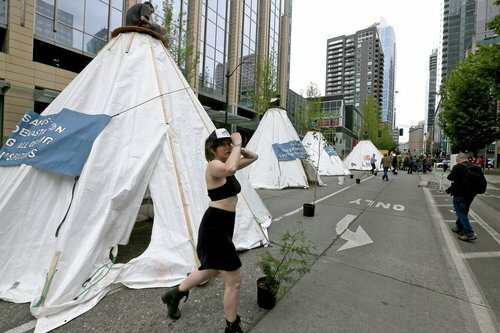 Police arrested about a dozen demonstrators who were protesting tar-sands development and the proposed Trans Mountain Pipeline in Canada on Monday, after they occupied the lobby of the Russell Investments Center and shut down traffic at Second Avenue and Pine Street with four teepees erected in the middle of the road. Chase Bank in particular was targeted for its investment in the Trans Mountain Pipeline. 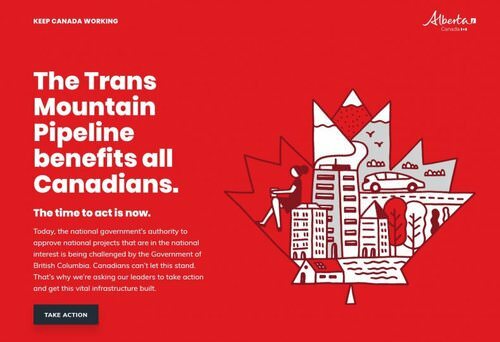 Alberta is rolling out an advertising campaign primarily targeting British Columbians to drum up support for the Trans Mountain oil pipeline expansion. Premier Rachel Notley announced Thursday that the province is spending $1.2-million to convince the public that Texas-based Kinder Morgan’s proposed pipeline linking Alberta oil producers to a terminal in Metro Vancouver would benefit all Canadians. Billboards supporting the massive west coast pipeline expansion project — which has provoked a provincial struggle and split public opinion — have been going up in B.C. over the last week in Vancouver, Victoria, Kelowna and Kamloops, Notley said at a news conference at the legislature in Edmonton. Notley also said she expects passage soon of new provincial legislation, Bill 12, which will give Alberta the ability to restrict energy shipments to B.C..
And continuing resistance from the mayor’s chair if Kennedy Stewart wins in the Fall. Kinder Morgan Inc.’s proposed expansion of an oil pipeline to Canada’s Pacific Coast will never happen because local opposition to the project that’s dividing the nation is only going to intensify, according to the mayor of Vancouver. “I don’t think this project will go — I really don’t — based on the resistance on the ground,” Gregor Robertson said in an interview Tuesday at Bloomberg’s headquarters in New York. After persistently prodding the National Energy Board, pipeline critic David Ellis finally got a report on Kinder Morgan's two oil spills along the Trans Mountain pipeline route. The spills happened last June, and had temporarily shut the pipeline down for investigation. What he saw on page two of Kinder Morgan's Engineering Assessment floored him. It stated that instead of just 20-25 barrels spilled near the Coquihalla Canyon, the pipeline leaked well over quadruple that amount. Will Trudeau’s pipeline support cost him the next election? During the 2015 election, I managed Vote Together, Leadnow’s campaign to help defeat the Harper Conservatives. We worked with thousands of volunteers across Canada who used every tactic in the book — knocking on doors, making phone calls, fundraising hundreds of thousands of dollars — to turn out voters for the candidates most likely to defeat Stephen Harper. In the 29 ridings we targeted, we helped elect 24 NDP and Liberal Members of Parliament. We weren’t alone. A handful of other groups ran similar campaigns, leading many, including the Conservative Party of Canada to name (or blame) third party campaigns for contributing to the outcome of the 2015 election: a Liberal majority elected with just 39.47% of the popular vote. In 2015, a dedicated, energized volunteer base campaigned relentlessly for change. On Election Day, whether it was a vote for change or a vote for their (now broken) campaign promises, many of those people voted, or encouraged others to vote, for Liberal candidates. They came from all walks of life but in my experience with Vote Together, an overwhelming majority of our supporters and volunteers were millennials, students, and retirees — the very same people who are turning out in big numbers to oppose the Kinder Morgan tar sands pipeline. This should have Prime Minister Trudeau and his party worried. 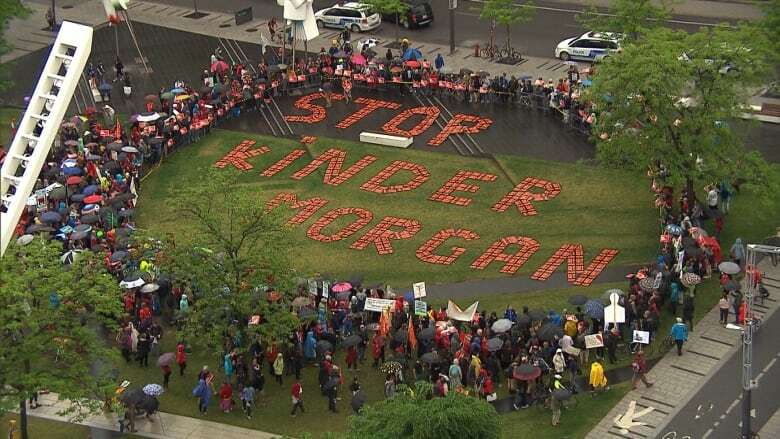 Whether it’s because of climate change, tanker traffic or Indigenous rights, more and more people are getting involved in the fight to stop Kinder Morgan. This energy could easily translate into an organized, active opposition willing to spend the time and energy necessary to cost the Liberals big time in 2019. Kinder Morgan has known since late last June that British Columbia’s newly elected government ran on a promise to stop the project arguing it is not in the public interest. Premier Horgan has not betrayed the public trust by breaking his election promises as did Prime Minister Trudeau. Kinder Morgan failed to take Horgan seriously. The company should have. It is Kinder Morgan’s shareholders who should bear the cost of Kinder Morgan’s executive decisions — not taxpayers. Kinder Morgan’s fanfare announcement is a cover-up. Trans Mountain pipeline expansion lacked commercial viability from the get-go. It has required government supported handouts at every stage of development. Kinder Morgan has put very little shareholder capital at risk. It has always looked to others — the shippers, Canadian investors and Canadian taxpayers — to do so. KMI washed its hands of financial accountability to, and financial responsibility for, Trans Mountain’s expansion back in 2014, but did not need to provide an alternate financing plan for the project until it was certain Ottawa would give the green light. KMI attempted to find a joint-venture partner for the project but there were no takers. It then decided to hive off its Canadian assets into a public entity and one year ago, KML was born. None of the proceeds from KML’s Initial Public Offering (IPO) were retained for use in the project. The $1.7 billion capital KML raised in Canada was sent to Houston to pay down debt the parent company, KMI, owes. Last July, KMI (the U.S. parent) announced that KML would be self-financing. It identified the outstanding equity the Canadian company would need: KML would need to raise $2.1 billion. The NEB based its recommendation to approve Trans Mountain’s expansion — and Cabinet in turn based its decision to grant the certificate — on a financial commitment Kinder Morgan publicly broke without so much as a sideway glance from Natural Resources Canada (responsible for the NEB) or the Department of Finance (now behind the bail-out package). KML raised $550 million through two preferred share offerings between August and December 2017, but costs over the past year have mounted sending the requirement north of $2 billion. ..enron all over again. how very very sad when that money could be used in so many better ways. Finance Minister Bill Morneau said Wednesday he is prepared to protect the Trans Mountain oil pipeline expansion to the west coast against financial loss. Ottawa has been in discussions with Alberta and Kinder Morgan, the proponent of Trans Mountain, over an arrangement to use public money to back the pipeline. "We are prepared...to indemnify the project against any financial loss that derives from (British Columbia) Premier (John) Horgan's attempts to delay or obstruct the project," Morneau said on May 16 at the National Press Theatre in Ottawa. Indemnity refers to a financial instrument where one party agrees to be liable to pay money or perform an obligation against an anticipated loss. "This indemnification would allow Kinder Morgan to finish what they started, what they received federal and B.C. provincial approval to do," said Morneau. He also said if Kinder Morgan decides not to proceed with Trans Mountain, "the indemnification would still be in place for another party who might wish to take over the project." Morneau said talks aren't over yet with the Texas-based energy company. "We are striving to get an agreement by the May 31 deadline," he said, referring to the date after which the company has warned it will likely pull out of the project. Canada and an American energy company want a First Nation in British Columbia to pay for their legal fees following ‘significant’ delay and prejudice to a stalled pipeline expansion project. A lawyer for Texas-based Kinder Morgan made this request in a newly-released court submission from May 14 that was sent to the Federal Court of Appeal. Counsel for Canada’s Attorney General, Jody Wilson-Raybould, made a similar request in a separate submission on May 11. The submissions were responding to an extraordinary motion submitted on May 2 by the Tsleil-Waututh Nation, requesting that the court compel the government to release uncensored copies of federal documents cited in a recent investigation by National Observer, including the release of new secret cabinet documents. Neither the company, nor the government denies that the high-ranking official provided these instructions, but they both claim any such behaviour is “irrelevant” because it doesn’t reflect the “actions” taken by Trudeau’s government in its official meetings with the affected First Nations. At least four other First Nations disagree and have supported the Tseil-Waututh Nation’s motion in separate court filings. In each case, these nations — the Coldwater Indian Band, the Stk’emlupsemc te Secwepemc (SSN), the Squamish Nation, and the Upper Nicola Band, say that the documents show that the government believed its approach was “legally sound” before it had even shared a report with the affected First Nations explaining how it planned to accommodate their concerns. All of these submissions fit into an existing legal challenge to Trudeau’s approval of the Trans Mountain project, which has been mired in delays. Several First Nations have asked the court to overturn the approval because they alleged that the government failed in its legal duty to consult them, as required under Canada’s Constitution. B.C. Environment Minister George Heyman criticized federal Finance Minister Bill Morneau’s pledge Wednesday to compensate Kinder Morgan for any losses caused by the province’s efforts to block its Trans Mountain pipeline project. And Attorney General David Eby has written his Alberta counterpart to say B.C. will sue for damages if that province proceeds with a bill that would let it restrict the flow of oil and gas to B.C. “Mr. Morneau appears more concerned about indemnifying a foreign corporation against risk to its investors than indemnifying British Columbia against the risk to our coast, to our environment, to tens of thousands of jobs and millions of dollars of economic activity in B.C.,” Heyman said. The province has sought to stop the project in court, first by joining a challenge launched by First Nations, then by putting a reference question to the B.C. Court of Appeal on the legality of proposed legislation that would allow it to restrict the movement of a substance that arrives from another province via pipeline or rail. “We are trying to ensure B.C.’s interests are protected, that our coast is protected, that products that are transported through B.C. are able to be done so in as safe a manner as possible and that if there is a spill, something nobody wants to see, that we’re in a position to respond adequately and clean it up,” he said. Meanwhile Eby has written to Kathleen Ganley, Alberta’s minister of justice and solicitor general, encouraging her to refer the Preserving Canada’s Prosperity Act to the Alberta courts to assess its constitutionality. Prime Minister Justin Trudeau lied to Indigenous people when he said there was no relationship more important to him than with the First Peoples of this land when he was elected in 2015, says a grand chief in Quebec. Grand Chief Serge Simon of the Kanesatake Mohawk Council said the proof is in Trudeau’s tireless support of expanding Kinder Morgan’s Trans Mountain pipeline. Earlier this week, the federal government said it will go as far as pay Kinder Morgan for any costs for construction delays and are still considering passing new laws to put the pipeline in the ground from Alberta to Burnaby, B.C. “Trudeau has said in the past his most important relationship was that with the First Nations and with this that is proving that was a lie. It’s not true,” said Simon on Nation to Nation Thursday. Prime Minister Justin Trudeau wants to throw billions in public money at Kinder Morgan to ensure the Trans Mountain pipeline expansion gets built. Write your MP and tell them you want any public investment to go to renewable energy, mass public transit and restoring a generation of cuts to the nurses, teachers and daycare workers whose work is already low-carbon. While the new filing by lawyers for the Tsleil-Waututh Nation, has not been accepted by the court, the Tsleil-Waututh say that the government has been trying to conceal evidence. “It would appear that Canada, relying on the fast pace of this proceeding, sought to suppress the evidence in question, gambling that the Court would decide the matter before the details of its bad faith could come to light,” said the letter from lawyers Scott Smith and Paul Seaman, who are representing the Tsleil-Waututh Nation. Lawyers for the Tsleil-Waututh say that the First Nation's efforts to assess the project and get access to federal records about its impacts have been stymied by the Trudeau government at every turn. They have also expressed skepticism about Canada and Kinder Morgan’s arguments that their motion to review new evidence be rejected since the two pro-pipeline partners have not directly denied the central argument in the Tsleil-Waututh’s case, which has been supported by other First Nations such as the Coldwater Indian Band, the Squamish Nation, the Stk’emlupsemc te Secwepemc Nation, and the Upper Nicola Band. Lawyers Smith and Seaman have specifically asked the court to review 15 separate documents that were censored by the government prior to being released to National Observer through access to information (ATIP) legislation, and compel the government to uncensor portions that have been kept secret. They also asked the court to reject arguments raised by Canada and Kinder Morgan subsidiary Trans Mountain (TM) that the evidence wouldn’t be relevant. Tensions over the Trans Mountain pipeline increased Thursday with British Columbia announcing plans to launch a lawsuit over new Alberta legislation that could restrict fuel exports to the West Coast. B.C. Attorney General David Eby said his province will ask the Court of Queen's Bench in Alberta to declare the legislation unconstitutional on the grounds that one province cannot punish another. Justin Trudeau’s pipeline nightmare may be only getting started. As Kinder Morgan Inc. drives a hard bargain in Canada’s attempt to save the Houston-based company’s embattled Trans Mountain project, the prime minister could end up fighting for an asset that hardly anybody wants. Pipeline giant Enbridge Inc., for one, signaled it doesn’t. Trudeau’s government upped the ante this week, with Finance Minister Bill Morneau pledging to indemnify the C$7.4 billion ($5.8 billion) project for politically motivated delays and backstop any company willing to take it on. Trudeau said “there are alternatives if Kinder Morgan” decides it wants out. Alberta’s oil sands are a crucial part of Canada’s economy and the expanded pipeline to British Columbia’s shore could help get better prices for the country’s crude in Asia. But finding an alternative investor in the face of fierce opposition in the coastal province would be easier said than done, according to Jihad Traya, manager of strategic energy advisory services for HSB Solomon Associates LLC in Calgary. When Ken Hansen was elected as chief of Yale First Nation three and half years ago he immediately had a financial gun to his head. Hansen said his nation was broke and on the brink of third-party management. So he had two choices. Take a deal with Kinder Morgan and use that money to maybe lift his community out of poverty. It would be just enough, he said, to buy him a year to turn things around. But then he would also be ignoring his own beliefs that his people are guardians of the land. Or he could implement the treaty that had taken years to negotiate between Yale and the federal and British Columbia governments. Doing that would have meant giving up his community’s rights and title. Hansen said he refused to implement it. “The treaty has not come into force,” he said. 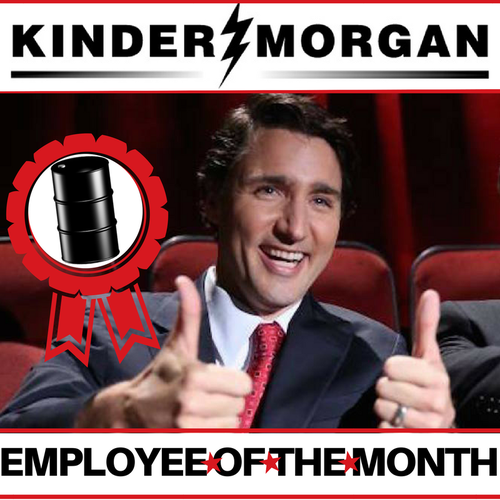 So he went with Kinder Morgan. Those deals allow the Texas company to expand its Trans Mountain pipeline through their First Nation or traditional territory. For many that suggests support for the project. That’s not how Hansen sees it, even if his administration sent a letter of support to the National Energy Board. It’s just a piece of paper he said. It was take the deal with Kinder Morgan or what he said is the worst treaty in Canada. On May 23rd at 2 pm, high school and other youth across the country will walk out of class, sending a clear message to Prime Minister Justin Trudeau (the self-proclaimed Youth Minister) that our land, climate and water and future are more important to us than this dangerous pipeline that does not have Indigenous consent. ..interesting collaboration piece between stewart phillip and tara houska..then finding it's way to the houston chronicle. phillip of course being grand chief in bc and houska a tribal attorney based in washinton dc. tara was also the indigenous advisor to bernie sanders in his recent leadership campaign. And with its Line 3 project, Canadian company Enbridge is looking to abandon an existing pipeline with a capacity of 390,000 barrels per day to build a new pipeline carrying up to 915,000 barrels of toxic diluted bitumen each day along a new route through the heart of Minnesota's lake country. The sacred wild rice beds of Ojibwe Tribes would be right along its path. Both pipelines ignited furious opposition. Resistance is particularly fierce in British Columbia and Minnesota, all in defense of the water, the climate and Indigenous rights. A total of 150 Indigenous Nations along the proposed pipeline routes and beyond signed the Treaty Alliance Against Tar Sands Expansion and pledged to ensure tar sands oil remains in the ground. TheTrans Mountain Expansion and Line 3 opposition movements, spearheaded by Indigenous women, have gained widespread and diverse support. The government of British Columbia, the governor of Washington State, and the city of Vancouver are aligned against the Trans Mountain Expansion. More than 20,000 Coast Protectors have pledged to do whatever it takes to stop the project. Since early March, some 200 people, young and old, have been arrested for blocking the gates of Kinder Morgan, including two federally elected politicians. Sixteen legal challenges to the project remain outstanding. Liberal MP Terry Beech wades into the front lines of daily protest on Burnaby Mountain, saying he doesn't want to get arrested but wants to ensure that those who do are treated with respect. He speaks calmly and confidently about the federal government's approval of Kinder Morgan's Trans Mountain pipeline proposal — a project he has previously voted against in the House of Commons and one that he says the majority of his constituents currently oppose. Beech has been one of Kinder Morgan’s most outspoken opponents, but he also explains how he is taking a pragmatic approach — now that the project has been approved — to find ways to make it better. Beech’s office recently sent out a survey to 44,000 households in the riding asking them what his top priority should be. Several hundred people mailed in responses to the open-ended query and the results were unequivocal. Some 58 per cent of the respondents said they were opposed to the expansion project, while 42 per cent supported it. These numbers contrast with other recent public opinion polls, surveying residents across the country, that appear to indicate a majority of Canadians support the pipeline, despite concerns raised by the project's opponents about spills and the potential impact on Canada’s national climate change goals. The Liberal MP says he is there to make sure they are being treated with respect, but won’t go as far as his colleagues in Parliament, Stewart and May, who were arrested for violating the court injunction. The issue of whether the government respected the rule of law when it approved the project is currently before the Federal Court of Appeal. Several First Nations and local municipalities, Burnaby and Vancouver, have asked the court to quash Trudeau’s decision, arguing that the government failed in its legal duty to consult First Nations, which is required under Section 35 of Canada’s Constitution. I'm a little perplexed about how quickly you jump on the bandwagon about no one wanting the TME. No company says anything about anything unless it is either to their benefit or required public disclosure. You can be sure, however, that interested parties will discuss any opportunity thoroughly in private. I think KM is bluffing because the expansion is too profitable to turn down and, as a regulated carrier, they can pass on any extra costs to the contracted ratepayers. We shall see next week although I suspect the only news will be the announcement of an extension of the deadline by KM and of 'continued progress' by the Liberals. Mr. Dress Up knows how to make a mess but, cleaning it up, not so much. Hopefully, the senior public servants can fix it for him. The Trudeau federal government has made itself a pathetic hostage to a Texas-based pipeline company known for its cheapness and debt. The economic sleaziness of the drama, which should upset most Canadians, has been largely ignored by the financial mainstream press. But here’s the rub: Kinder Morgan doesn’t have the money it needs to twin a high-risk $7.4 billion pipeline, and has been looking for a way out for some time. Meanwhile, it has blamed entirely predictable and expected project delays on the B.C. government as well as First Nations and municipal resistance to the pipeline. At that point Finance Minister Bill Morneau probably blanched. Last week he temporarily emerged from negotiations and tried to outflank the Texans by promising that the government would compensate Kinder Morgan, or any other interested pipeline builder, for any losses incurred for political reasons while twinning the unnecessary Trans Mountain line to Vancouver. It is instructive that the Kinder Morgan executive delivering the big bill for taxpayers is none other than Enron’s former senior vice president of government affairs. But money and not political uncertainty — a reliable companion of the project from the first day of public hearings — is the central issue here. Faced with the iron law of megaprojects (“over schedule and over budget and over and over again”), Kinder Morgan simply wants to walk away from an unviable project whose costs have ballooned from $5.4 billion to more than $7.4 billion. ..txs quizzical, i'll check that link out. Yesterday in Seattle, over 200 km south of where the pipeline hits the coast, hundreds of “kayactivists” took to the water to protest against the pipeline. They were part of a demonstration by the US environmental group, Mosquito Fleet, Greenpeace US and Sierra Club that organised a rally in the city against Kinder Morgan’s proposed pipeline expansion. Tensions are certainly rising. Kinder Morgan has given the Federal government of Canada until the end of the month to resolve outstanding financial and legal issues surrounding the pipeline. 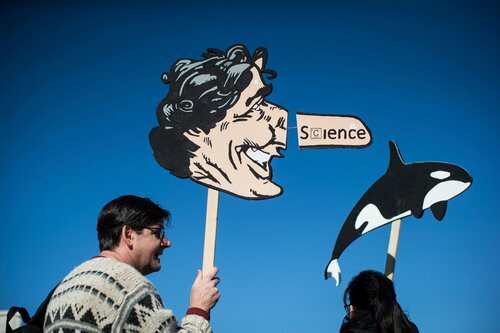 Last week, in order to appease the Texan oil company, Trudeau’s Government announced that it will effectively give the Kinder Morgan a “blank cheque” “to indemnify” the pipeline “against any financial loss,” suffered if they build the pipeline. The move sems to have backfired and emboldened everyone fighting the pipeline. And as the May 31 deadline gets closer, there is a growing awareness not only of the threat that the pipeline poses to the climate, but also to marine life as it would massively increase the tanker traffic up the West Coast of Canada and US. ..a relatively new and growing international community working together. Today, an open letter signed by 236 international civil society organizations in 44 countries called on Canadian Prime Minister Justin Trudeau to stop backing the Kinder Morgan tar sands pipeline project and begin planning for a managed decline of fossil fuel production. The letter points out the clear contradiction between Prime Minister Trudeau’s unchecked support for the Kinder Morgan pipeline project and his commitments to Indigenous reconciliation through the United Nations Declaration of the Rights of Indigenous Peoples (UNDRIP) and his obligation to address climate change through the Paris Agreement. VICTORIA — The City of Vancouver and Squamish Nation have lost legal challenges aimed at quashing an environmental assessment certificate issued by the British Columbia government for the Trans Mountain pipeline expansion. The B.C. Supreme Court issued separate written judgments Thursday in the cases. The BC Supreme Court has a history of getting aboriginal law really, really wrong. Chief Justice McEachern in Delgamuukw is the prime example of racist drivel from the courts. Nearly 200 students in Vancouver and other B.C. communities walked out of their high schools on Wednesday to protest the expansion of Kinder Morgan’s Trans Mountain pipeline. Students stood up in their classrooms at 2 p.m., gave speeches encouraging other students to join them, and headed to the downtown Vancouver Art Gallery. The walkout was supported in at least two other communities outside Vancouver. At 10 a.m., youth in the Heiltsuk Nation's traditional territories in northern B.C. held their own school walkout in solidarity. Jess Housty, an elected councilor with the Heiltsuk Nation, said that over 50 students walked out of class in Bella Bella to protest Kinder Morgan's pipeline expansion. Hereditary and elected leadership, as well as community members, stood with them. According to the Warrior Up: Walkout Facebook page, over 100 students also walked out of Gulf Islands Secondary School on Salt Spring Island. https://www.facebook.com/events/1704127356346194/ 27th of May, 13h30 (1:30 PM). Canada has become a petro state. It is time we come to grips with this as a nation. We have a litany of examples of both provincial and federal politicians playing fast and loose with the rules to force an unwilling oil tanker pipeline project on an unwilling province. How far will they go? Pretty far! Harper gutted environmental laws, illegally spied on groups opposing oil and gas projects, and tried to demonize opponents by calling them foreign radicals. A succession of Alberta premiers have huffed and puffed until Rachel Notley crossed the line by proposing to impose illegal trade restrictions on exported oil and imported B.C. wine. Justin Trudeau lied about Kinder Morgan to win votes in B.C., only to betray his commitments once in power as prime minister. Now we learn of evidence that Trudeau’s government threw the rule of law out the window and rigged the process to fast track and guarantee Kinder Morgan’s approval. What’s clear is this: politicians have cynically pontificated about the “rule of law” while bending the rules to force Kinder Morgan through. Many Canadians have bought the propaganda — but in British Columbia? Not so much. In Canada’s western-most province, the aggressive language and underhanded tactics from the eastern side of the Rockies are inspiring an unprecedented number of British Columbians to step out of their comfort zone and stand together against an unjust process. While politicians and pundits pontificate, people are organizing. Whether they are concerned about runaway global warming, Indigenous rights, oil spills, or the inherent right of people to decide their own future, British Columbians are coming together to ensure Trans Mountain never gets built. What the people of British Columbia know is that, if all else fails, as law-abiding citizens they can resort to civil disobedience — or, as I prefer, “civil resistance.” Anyone with a marginal understanding of history knows civil resistance is a critical political tool. The power of civil resistance lies in the debate it generates about the law and the moral justification of violating it. By defying a societal norm, and being willing to suffer the consequences, citizens shine a spotlight on bad laws or draconian consequences and seek to bring them into disrepute while catalyzing others to stand against them. To be effective, civil resistance cannot be engaged in lightly. It has to be widely perceived as a “reasonable” response, undertaken only after exhausting all other options. Ironically, the patently unfair federal and provincial processes behind the Kinder Morgan rubber-stamp, combined with the recent bully tactics from Alberta and Ottawa, are convincing tens of thousands of concerned British Columbians (as well as climate and Indigenous activists from around the world) that civil resistance is the only reasonable response to an ongoing injustice. People outraged by these injustices are worried that their provincial government may not have strong enough tools to defend British Columbia’s interests from out-of-province bullies, but despite this, they are willing to risk arrest to stand up for their province, Indigenous rights, and the climate. Three prominent Quebec-area Indigenous chiefs are denouncing Kinder Morgan Canada's Trans Mountain pipeline expansion project. Assembly of First Nations regional Chief Ghislain Picard, Mohawk Chief Serge Simon and Innu Chief Jean Charles Pietacho spoke out against the pipeline at a protest today in Montreal. The goal of the event was to show solidarity with First Nations and other groups who are fighting the project in British Columbia. Picard said the pipeline debate cannot be kept to one province because issues surrounding climate change are indivisible. The chiefs were joined by several hundred cheering people of all ages, including environmental activists, union members and First Nations groups. ..a long list of signatures. Please take a moment to really think about that. We are not asking for your name, or your political title, or even what Métis government you claim to represent. As Métis youth, women and Two Spirit people from across the homeland, we want to know who you really are, and when in your journeys did being Métis simply become an identity to assert in order to obtain money and power. When did you leave behind your responsibilities as Indigenous people and when did you lose connection to our ancestors of the past and our children of the future? Did you forget about them? Did you forget about us? there's been a spill at Barriere. Speculation is mounting in Ottawa that the Trudeau government is poised to take over the embattled Trans Mountain pipeline project after its Texas-based proponent, Kinder Morgan, cancelled a federal construction permit application needed to pursue the oil pipeline and tanker expansion. The Vancouver Fraser Port Authority confirmed in a May 14 email, obtained by National Observer, that the company had withdrawn an application to build a temporary construction barge on the West Coast that would have been needed to pursue the project. "The applicant for the above-noted proposed project has advised us that they are no longer planning on pursuing this proposal and requested that their permit application be withdrawn/cancelled," said an official from the federal agency in a May 14 email sent to the Tsleil-Waututh Nation in the Burrard Inlet of B.C. "Our review of the proposed project is therefore cancelled." The application is among more than 1,000 permits needed for Trans Mountain to proceed with construction on the project, which aims to triple the capacity of its existing system to transport up to 890,000 barrels of diluted bitumen and other petroleum products per day from Alberta. The withdrawn application could mean the company would be forced to wait up to 60 business days to proceed with construction plans, if it decides to reapply for that construction barge permit, according to the federal agency's approval process. The federal cabinet has been summoned to a meeting Tuesday morning — two hours earlier than usual — after which Morneau will discuss which of the three options the government has decided on. My first question is what discount did the taxpayers get for an insolvent project? ..from an email from coast protectors which is an indigenous led movement. Finance Minister Bill Morneau just announced a multibillion bailout package for Kinder Morgan. As he was peppered with questions by skeptical reporters, all I could think of was that day in November 2016 when thousands of us marched to demand Justin Trudeau live up to his campaign promises of a proper assessment of this risky pipeline and tanker project for carcinogenic diluted bitumen. Instead, he and his government decided to trample Indigenous title and rights, ignore oncoming climate chaos and double down on dirty tar sands oil. Take a few deep breaths and remember, we are here for the land, the air, the water and those who can't speak for themselves, the whales and the salmon. Please join us in Vancouver tonight at the 'No Bailout, No Kinder Morgan' rally at Science World, at 5:30 pm. RSVP by text or on Facebook. Bailing out a project that is collapsing under its own weight while legal challenges from Six First Nations are outstanding and Protectors are on the ground resisting is a fool's errand. My MP, Alexandre Boulerice, was at the MTL rally. My MNA, Gabriel Nadeau-Dubois calls it a betrayal of his (young) generation and an environmental and economic disaster. I'm not on Facebook, the short speech is at the beginning of GND's Facebook page, if someone can link it. Trudeau's riding is just north of ours (north of Jean-Talon). Riding office on Jarry, near Jarry métro. Hope there are local protests.